That is part of the latest technology of Rasor Direct Drive such as the knife installed on the same axis of the motor. DD120RC has no coupling gear which means no maintenance (i.e. the lubrication with grease) reducing therefore also the operation cost while using during the no-stop 24h/day production process. 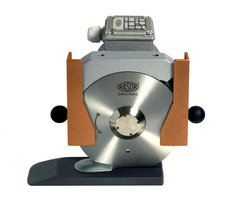 The knife can reach a speed of 2600 RPM so this tool comes perfect for the high speed no-stop cutting process. The induction three-phase motor is balanced and silenced with no maintenance needed assuring reliability for life. The knife is 120 mm diameter 8-edges and allows to reach a cutting thickness of 50 mm even as multi-layers. The aluminum Teflon® coated base reduce the friction between the foot and the material and allow the easy forward movement even for an installation sliding rails. The minimum needed maintenance and low production cost make DD120LC to be a reliable cutting solution in any high speed O.E.M. application.